Water/methanol injection for gas engines is a proven means for effectively reducing engine inlet air temperatures and suppressing harmful detonation on high compression naturally aspirated (NA) race engines. This allows racers to reliably advance ignition timing—without using high-octane racing fuel—for improved power gains. 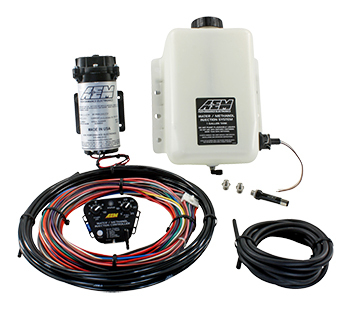 AEM’s Water/Methanol Injection Systems utilize the most robust hardware combined with more advanced features than any other comparably priced water/methanol system. Depending on the system, timing can often be advanced 10 degrees or more when a water/methanol system is used. Boost can often be increased five or more psi. When combined with the cooler air intake charge created by the water and methanol, these changes can net a horsepower increase of up to 20 percent in power-adder applications. In naturally aspirated applications, horsepower gains of 5-10 percent are possible on NA engines. AEM's Multi Input controller design enables users to install Water/Methanol Injection on high compression naturally aspirated vehicles (NA) via the MAF/IDC settings. The Multi-Input controller works with an external 0-5v voltage-based external MAP sensor, a frequency based input for Injector Duty Cycle (IDC), frequency-based mass airflow (MAF), or a 0-5v voltage-based MAF. 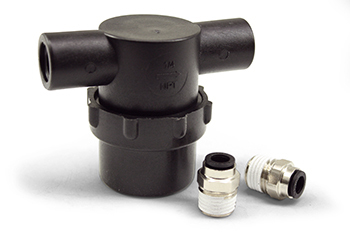 The Multi-Input Controller is available with a one-gallon tank (PN 30-3350), five-gallon tank (PN 30-3351) and in a tank-less kit (PN30-3352). Note: FOR OPTIMUM RESULTS, ALL WATER/METHANOL INJECTION SYSTEMS AND GAUGES SHOULD BE RUN WITH AN AEM INLINE FILTER (AEM PART #30-3003)bing includedLED dash light for system status and low fluid warning Legal in California only for racing vehicles which may never be used upon a highway. Filter (AEM PART #30-3003)Free shipping when ordered with Meth kit!